The sixth annual Betting on Football conference proved to be another successful iteration for both exhibitors and delegates, as the sports betting industry came together for an event full of talk of promise in the US while contemplating regulatory and public pressures closer to its base at Stamford Bridge, London. 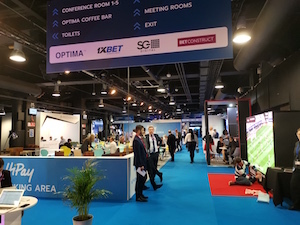 A total of 29 exhibitors were complemented by big-hitters in meeting rooms upstairs at the home of Chelsea FC, while in the conference rooms there were a series of well-attended talks – not least the captain’s address by AC Milan and Italy legend Franco Baresi. The vibe of the conference floor was of an event that proved very useful in terms of discussing trends and products, while also allowing plentiful networking opportunities. In the official conference programme, a note of defiance was sounded on behalf of an industry that has taken flak in recent times from politicians in the UK and beyond. Andrew McCarron, SBC’s managing director, argued that events such as Betting on Football have a major part to play in formulating strategies to defend bookmakers in the face of criticism and to also address the issues where the industry is lagging behind compared to where it needs to be. “The ability to actually have a sensible debate on the issue rather than looking like bookmakers had something to hide has affected public perception greatly,” he said.